Visiting Seville, Cordoba, Granada, Ubeda and Lorca. This is a tour of the most glorious and sunniest region of Spain. It takes us to the cities of the Golden Age of Muslim and Jewish culture, an age when these communities lived happily together and produced marvels of science, philosophy, poetry and art. You will see wonderful Muslim architecture and moving memories of the Jewish presence which came abruptly to an end when the Catholic monarchs Ferdinand and Isabella captured the territory, driving out the Moors and expelling the Jews in 1492. The last few years have seen several excavations of Jewish sites, in Ubeda, Lorca and Lucena, two new Jewish museums in Granada and improvements to the exhibition at the House of Sefarad in Cordoba. Even if you have visited the region before there will be much new to see and expert guides to help you recapture the 15th century world of el Andalus. Departure on RyanAir No 8363 from Stansted at 12.20 landing in Seville at 16.10. We are met by our Seville guide Moises Hassan, the foremost expert on the history of the Jewish people in Spain. He takes us on a coach tour of the important sites of the city, stopping at the Plaza de Espana for a walk around the magnificent 1929 Expo site. After checking in at our hotel Sevilla Macarena we go out for a group meal. Those who wish can go on to a flamenco performance. 9am Moises Hassan takes us from our Hotel just over the road to go through the ancient city walls into the heart of Seville and towards the ancient Juderia, now a beautifully renovated (above). Moises tells us the story of life there before the Expulsion with deep knowledge and passion. From about 12.30 you are free to visit your choice of Seville’s remarkable sites that include the vast Cathedral, the Alcazar, the Giralda Tower and a small Jewish Museum. Free Evening. We leave at 8.30am for the delightful city of Cordoba where we meet our guide, archaeologist Isabel Martinez. 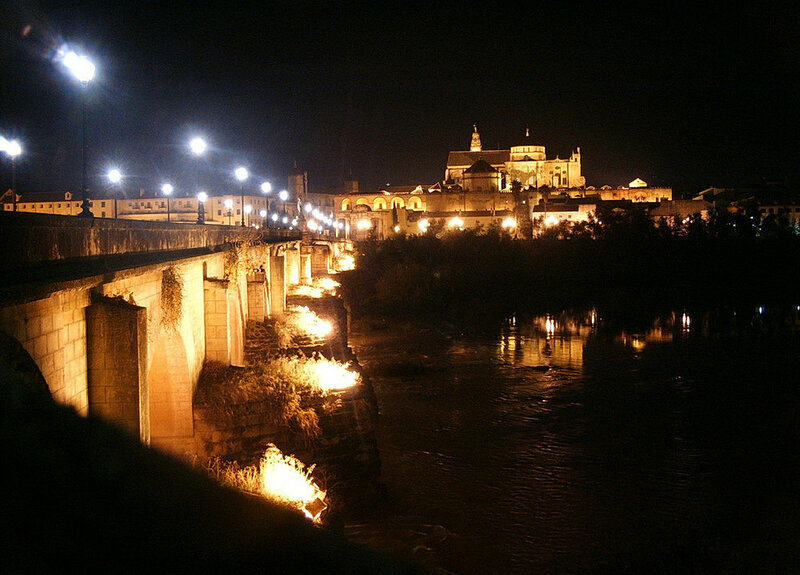 We start by crossing the impressive Roman bridge (below) and visit the Calahorra tower where an audio-visual display tells the story of a period when Muslims, Christians, and Jews, including Samuel Ha-Nagid, Moses ibn Ezra and Moses Maimonides, thrived together in the city. We return for a tour of the huge complex that makes up the Mezquita, the magnificent mosque that was converted into a cathedral. Then on to see the oldest synagogue remains in Spain and the atmospheric Juderia, the Jewish quarter. Here we find the House of Sefarad, a small museum with a passionate guide. We check into our hotel, NH Collection Amistad, in the heart of the Juderia. Note that here and in Granada you will have to walk for about six minutes from our coach, with your luggage. Worth it for great hotels in wonderfully central locations. There is access by taxi but this is a long way round and you will be responsible for the cost. At 2.30pm we are once more joined by Isabel Martinez and visit the Alcazar de los Reyes Cristianos with its beautiful gardens and water features. You will still have time to explore the city on your own in the late afternoon and evening. 9.30am We leave for Lucena, described in the 12th century as a Jewish city with a Muslim suburb. A Jewish cemetery, the largest in Spain, was unearthed in 2006/2007 while a ring road was being built. This hillside cemetery, restored with great respect for its holiness, is opened up for us by Jose Antonio Garcia Suarez of the tourist office, who also shows us around the castle museum and the narrow streets where yeshiva used to be, now increasingly being given Hebrew names. We then visit the barber of Lucena who treasures the city’s Jewish past and has made several trips to Israel. After a break for lunch we head for Granada and the Hotel Hesperia (above) where we spend four nights. This hotel is perfectly situated on the edge of the Realejo, the former Jewish quarter, in a pedestrian area near the town hall, close to shops and excellent restaurants. We will gather at 7.30pm at our hotel for a group visit to a flamenco show, preceded by vegetarian tapas, nearby. 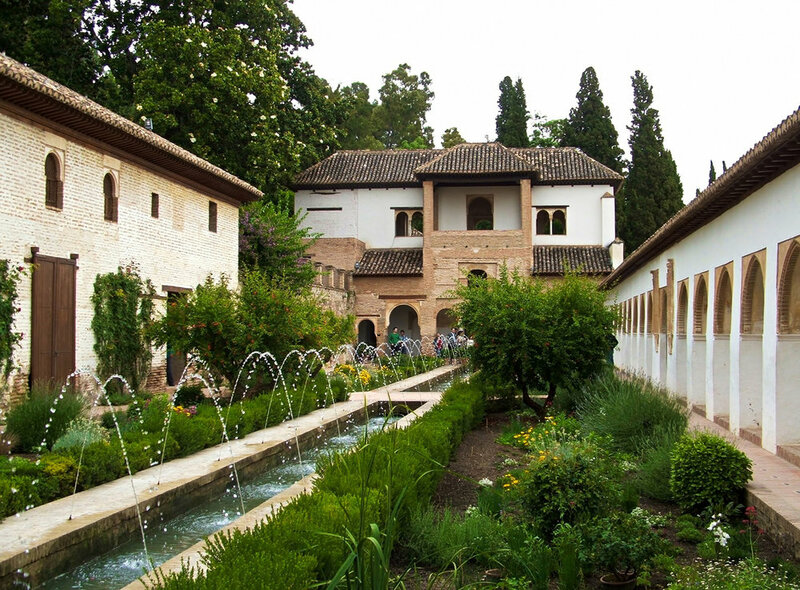 We start at 9am with top Granada guide Conchi Fernandez Cueto to visit the Alhambra Palace and the Generalife Gardens (below), the unequalled Moorish gem of Spain, and its most visited site. After free time for lunch we meet to visit the Jewish museum Palacio de los Olvidados, the Palace of the Forgotten that opened in January 2014. At 5pm we leave our hotel for the Centre of Sephardic Memory, another Jewish Museum in the Realejo, that Gabriel and Beatrice (now Bathsheba) Chevalier opened in their own home in 2013. Beatrice will tell us their story and this will be followed by lighting candles and a kabbalat Shabbat and kiddush service to which the few Jewish residents in Granada will be invited. We will have a group evening meal in the nearby Granadas Demasqueros Restaurant with a selection of vegetarian dishes, including the delicious dorado fish, with kosher wine purchased from the Barber of Lucena. Day free to visit museums and places of choice such as the composer Manuel De Falla’s house. A pre-booked lunch can be arranged. In the afternoon Molly Piccavey, a native of Nottingham who fell in love with Granada when she arrived 15 years ago, will take those interested on a tapas crawl of the city that will include tea in the magnificent grounds of the Parador attached to the Alhambra and a visit to the Sacremento caves, the home of authentic flamenco in the city. This will be an extra cost. We leave at 9am for a day trip to visit the delightful town of Ubeda where a water synagogue (below) and mikva were recently discovered in the heart of the city. We will be brilliantly guided in Ubeda and nearby Baeza by Mr Andrea Pezzini who was responsible for the synagogue restoration works. We return to Granada for the final night group meal which will be booked at The Loft restaurant near the Hotel. We leave at 9am for a two-hour journey to the city of Lorca in the Province of Murcia. In Lorca, while a new Parador Hotel was being built in the castle on top of a hill in 2011, a devastating earthquake hit the city. This revealed what was identified to be a 15th century Jewish quarter with a large synagogue (below) by the castle gates. This has been beautifully restored under the new Parador. Such was the importance of this find that the Chief Rabbi of Israel visited last year. We will also visit the town’s museum and historic quarter and have lunch in the Parador. Following an afternoon tour of the Lorca city centre we board our coach and head for Murcia airport to catch the RyanAir flight No FR8027 at 20.50, landing at Stansted at 22.40. Main Tour The cost is £1,135 pp sharing a twin/double for 7 nights - single supplement £295. This covers hotel b & b, all guided walks and museum fees that are part of the programme, plus 4 meals as per programme and the Thursday night flamenco show. It excludes flights and travel insurance. This trip is for Jewish Renaissance subscribers only. Those who are not yet subscribers can join for £29 for a year. A deposit of £200 per person [refunded if trip does not proceed due to insufficient numbers] will be required to be sent to West End Travel who will be administering the trip. They will notify you once we have the requisite numbers and give the go-ahead to book flights. If you are interested in joining this trip please email janet@jewishrenaissance.org.uk for a booking form or phone us on 020 7794 5254.